Each padlock comes with 2 keys but you do need to order your individual "master keys" separately. We recommened only 1 or 2 to begin with. Why is this padlock special? 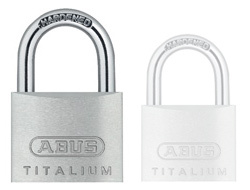 This is a very new style of padlock made using a combination of alumimium and titanium. Not only that but we're the only company in the entire world to offer it in a Master Key format! But why is it so special? 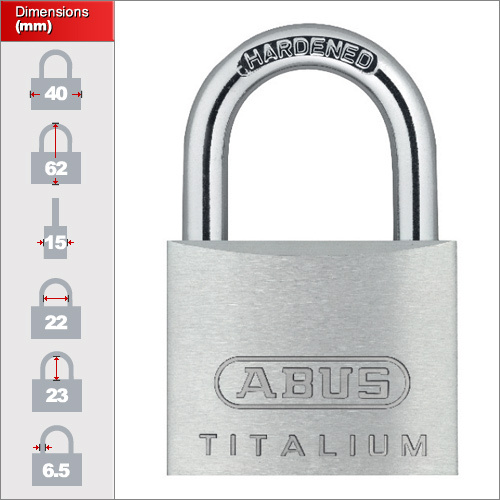 It has the same high quality mechanism found in other ABUS padlocks with a strong hardened shackle that is finished with a special Nano coating. This basically keeps the shackle rust free more effectively than standard nickel coatings found on other padlocks. It is also exceptionally light weight without loosing strength! In most circumstances no. Even if every padlock was duplicated twice, the likelihood of finding the other padlock in a large set is slim. However, in some situations, especially in small sets, it is necessary to guarantee every padlock will be unique. In this case please contact us and we can quote for a special order which the locks can be made up from scratch and recorded. With the shortage of copper on the international market, the price of brass has increased by over 80% in the last two years and will continue to increase until it is not feasible to construct padlocks from it any longer. Also note that we can engrave this padlock and their keys if necesaary. This could be useful if you wish to issue one of the 2 keys that come with the lock, and then store the other in case of loss. Please contact us for futher details and pricing which starts are £1.50 per lock.